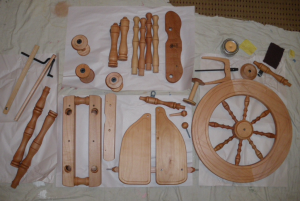 A milestone – everything is now sanded, waxed and buffed. You can still see the variation in colour, expecially in those legs (top centre). About three quarters of the tin of polish has been used. The next step is to figure out which bits will be difficult to get at once it’s asssembled and give those areas a second application.